Reunion in Madison, arguably the most upscale, multi-faceted, planned community ever developed in Mississippi, came about almost as an accident. And, several former Delta residents now have homes in Reunion and commute to the Delta for work. Attorney David H. Nutt purchased the 2,100-acre site in the late 1990s thinking to use it as recreational property. 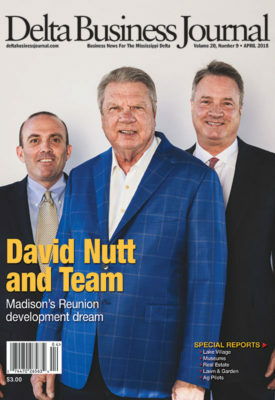 But when it became apparent that one of Mississippi’s fast-growing cities, Madison, was expanding in the direction of the property, Nutt decided to put the land to use creating a residential and commercial development to be rivaled by none in the state. As an attorney with David H. Nutt & Associates, Ridgeland, Nutt began his practice defending corporations in major civil lawsuits. He practiced many different types of law before over time developing a practice that included representing about 20,000 workers exposed to asbestos and participating in the national tobacco litigation. But Nutt’s biggest legacy to the state—and what he is most excited to talk about—isn’t his work with asbestos or tobacco, but instead his vision to create a community with every amenity a resident could possibly dream of. Nutt came to own the Reunion property because of a long-time interest in investing in land. In addition to the property in Madison County, he has invested in cattle and recreational hunting land in Texas, Wyoming and New Mexico. He recalls first getting interested in the Reunion property because he drove by it every day on Highway 463 on his way to work. Reunion used the Bailey Company for about five years. After that Nutt took over the reins and started developing the property in house. Nutt said the topography dictates much of how the lots are laid out. Homes are configured around amenities like the golf course and 400-acres of lakes. There is a wide range of square footage of homes in Reunion. One benefit homeowners get is being surrounded by nature. Of the 2,100 acres, over 600 acres is green space which includes 400 acres of lakes. The golf course covers about 275 acres. That puts almost half the property as natural areas. Reunion is so attractive that it even has a least one resident who commutes to work in the Delta. For other residents who work in the capital area, it is an easy drive to work. Sometimes it is the bad times that can tell the most about a development. The housing recession in 2008 had an impact on Reunion. Their sales fell off 50 percent. What exists today might be considered a sort of second generation of Reunion. They built all the lakes and other amenities, and now are moving forward increasing offerings. “So, a lot of neat things are happening,” Nutt said. “We’re opening our 33,000-square-foot clubhouse this year. It is a big deal, a $15-million construction project. The clubhouse will have two restaurants, one more informal and a formal dining room built where it can be sectioned off. There will be seating for 250 for sit down dining and room for a standup crowd of 500. We are also doubling the size of the fitness center and will have a full-service spa. Nutt’s wife, Kristie, plays a key role at Reunion. The new clubhouse is not the only new amenity under construction presently at Reunion. About $40 million total is currently being invested overall, in addition to the more than $120 million previously invested in the entire development. Nutt is still involved in legal work involving complex large projects including pollution and water rights cases. He usually works more in an advisory role for attorneys with large cases. And he also has other ventures in business and real estate. Nutt received his undergraduate degree and law degree at the University of Mississippi (Ole Miss). He says part of the reason he went to law school is that he loved college so much he didn’t want to leave. And since leaving, he has been a major financial supporter of Ole Miss; with the result of the David H. Nutt Auditorium on campus being named in his honor. While he has made numerous other gifts, he gives most of his donations to Ole Miss and others anonymously. “I kind of like it that way,” he said.